Danube & the Mystic Trails is guided cycling tour, which goes on the most interesting tableland of Southeastern Europe situated between the Danube and the Balkan Range. Rolling hills, rustic scenery and the wild steep banks of the Danube traced the terrain of the cycling route. In the program are included visits to 4 UNESCO sites, to the best dairy farms for Bulgarian yogurt and some possible attractions in Romania, like to go for city cycling in Bucharest and to pedal around Bugeac Lake. 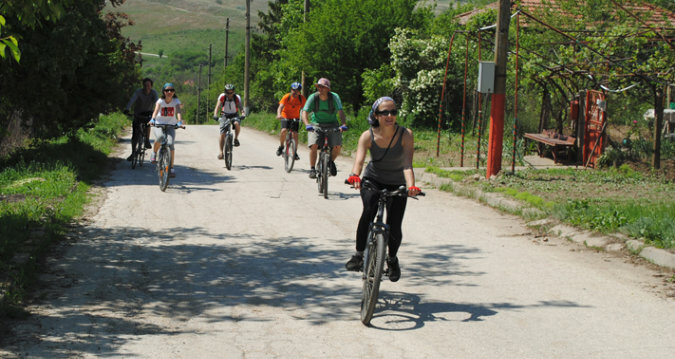 The first part of the cycling tour, ACROSS THE PLATEAU OF LUDOGORIE, emphasizes on the unique cultural heritage of powerful antique Thracian and medieval Bulgarian states, which based their capitals in this region. We’ll discover amazing monuments of the Alevi culture. Finally we reach the Danube at the quaint town of Tutrakan and cycle for a day in its surroundings. The other part is ALONG THE DANUBE. The tour continues along the romantic river, following the ancient Roman road Via Militaris. We’ll enjoy the spectacular wild banks, islands and lakes by the Danube, the small picturesque villages, the valuable landmarks of Silistra and throughout its vicinities. The both parts represent our longest moderate cycling tour in the Lower Danube region. Book for one of the 6 days parts and take discount for the other part of the tour. Flexible program and more dates.